One of the most heavily used materials for water purification filters is carbon, usually in the form of activated carbon – i.e. carbon treated with oxygen to open up microscopic pores). This high degree of porosity and the resulting high surface area make this material ideal, among other things, for removing pollutants (that are attracted to carbon, such as volatile organic compounds, pesticides and benzene) from water. One of the problems with activated carbon is the disposal of adsorbed contaminants along with the adsorbent. Another concern is that its pores are often blocked during adsorption. By contrast, carbon nanotubes’ (CNTs) open structure offers easy, undisrupted access to reactive sites located on nanotubes’ outer surface. 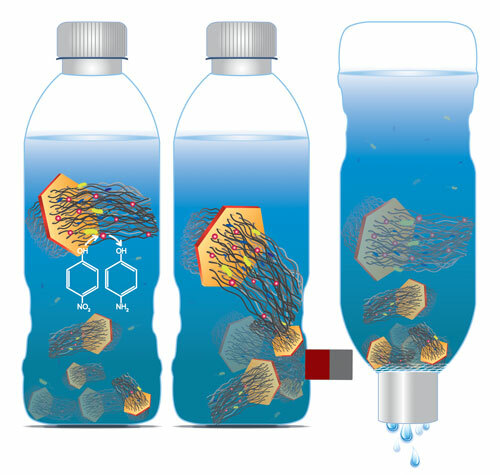 That’s why researchers see CNTs as an attractive potential substitute for activated carbon (see for instance: “Smart capsules for water treatment with recyclable carbon nanotube cores”). “An issue with using CNTs for water purification of course is the fact that unbounded nanotubes would pose health risks to humans and the ecosystem because they are difficult to separate from treated water,” Chongzheng Na, an Assistant Professor in the Department of Civil and Environmental Engineering and Earth Sciences at the University of Notre Dame, tells Nanowerk. In new work published in the May 7, 2014 online edition of ACS Applied Materials & Interfaces (“Multifunctional and Recollectable Carbon Nanotube Ponytails for Water Purification”), Na, postdoc fellow Haitao Wang, and graduate student Hanyu Ma, have demonstrated that individual CNTs can be integrated into micrometer-sized colloidal particles without using a heavy or bulky particulate support. Organizing individual nanotubes into hierarchical structures represents a new strategy to scale up nanomaterials for macroscopic engineering applications. The researchers grew CNT arrays of hundreds of micrometers in length on nanometer-thin mineral discs with a negligible mass and volume, a structure they termed carbon nanotube ponytails (CNPs). The layered double oxide (LDO) discs are slightly magnetic. This magnetization is sufficiently weak to prevent CNPs from aggregating under self-attraction but strong enough to be utilized for separation. “Compared to individual CNTs, CNPs can be more effectively separated from water using gravitational sedimentation, magnetic attraction, and membrane filtration while having the ability to perform adsorption, disinfection, and catalytic degradation of contaminants in water”, explains Na. To address the CNT separability issue, researchers previously did the same thing as Na’s team, i.e. increase the overall size of CNTs. For example, CNTs were fixed on inactive colloidal particles. What makes the CNT ponytails special, though, is that they contain little supporting material. An interesting aspect from a material synthesis point of view is that this work demonstrates the preparation of CNT colloidal particles nearly free of support without involving exotic procedures – i.e., CNPs are made using the same standard chemical vapor deposition method for CNT growth using a slightly different catalyst material. In their water purification experiments, the researchers showed that their CNPs are as good as CNTs for removing contaminants from water as adsorbents, disinfectants, and catalyst supports. Unlike unbounded CNTs, as Na points out, CNPs can be separated more effectively using common techniques such as gravitational sedimentation, magnetic attraction, and membrane filtration. 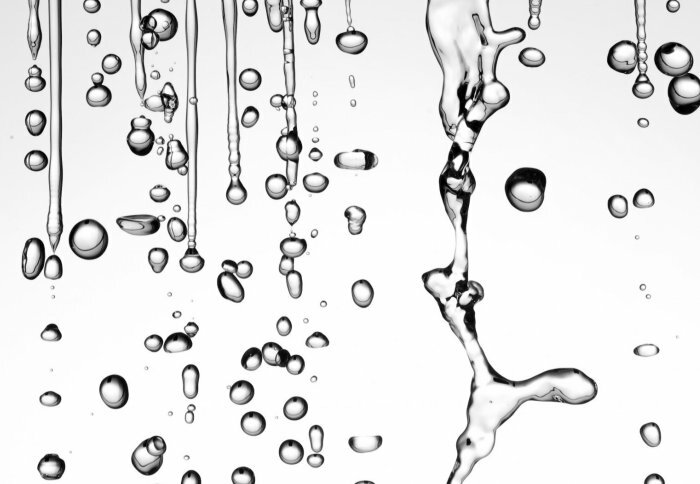 Given the recent advances in nanotechnology, the water community has been searching for ways to incorporate nanomaterials into treatment processes. There is, however, a tremendous dimensional disparity between the nano world and the water world. No one is interested in nanoliters of water. When people talk about water, they talk in units such as million gallons per day. The challenge is how to connect these two worlds on the dimension ladder. “What we did in making CNPs has done precisely that,” says Na. “By integrating nanotubes into colloidal particles, we helped CNTs climb from the nanometer rung to the micrometer rung on the dimension ladder. By incorporating magnetism into CNPs, we elevated CNTs even further to the centimeter scale.” “In our future research, we will keep looking for better ways to connect nanomaterials to the world that we live in – in technical terms, we will be researching for new strategies to scale up nanoscale properties for water purification,” he concludes. This entry was posted in Environment, Nanotechnology and tagged Carbon Nanotubes, Environment, Nanotechnology, Science.